KATHMANDU, March 2: Price of onion has started coming down to normal levels after reaching a record high level in the domestic market. In the past few months, price had risen exorbitantly due to curbing of onion export by India, which is the main supplier of onion in the country. Price of onion had stood high in the months of November and December, and reached Rs 140 per kilogram in the retail market at one point. Experts and officials have said that the price level is falling gradually due to ease in import of onions from India. The price of onion was at a usual level of Rs 55 per kilogram in the beginning of October, according to the retail price charts of Kalimati Fruits and Vegetables Market Development Board (KFVMDB). The price beginning at Rs 75 per kilogram in November was almost stable at the range of Rs 75-85 per kilogram. But, the price suddenly jumped from Rs 85 on November 24 to Rs 115 on November 25. This was because India had curbed export of onions, setting a minimum price of US $ 850 per ton. India did so to control the price hike of the ‘politically sensitive product’ in its market owing to fall in the domestic production. The onion prices troubled Nepali kitchens throughout the month of December, standing at Rs 115 a kilogram in the beginning of the month. 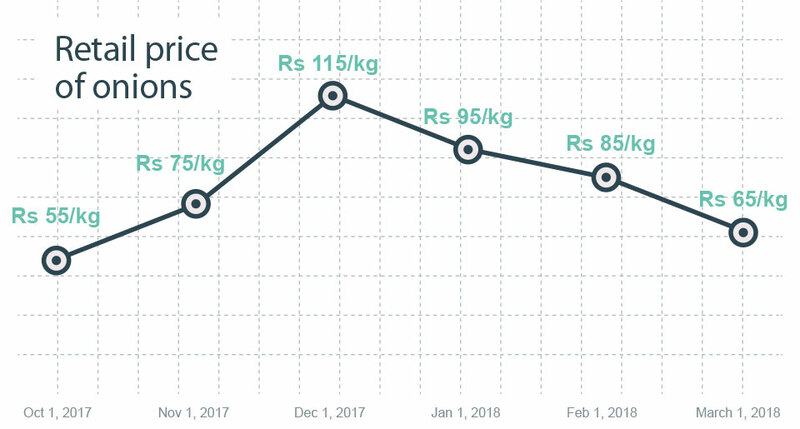 The price on January 1, 2018 was Rs 95, which further decreased to Rs 85 on February 1. Towards the end of February, the price of onion started dropping. The retail price has stayed at Rs 65 as of Thursday, which was the continuation of the price drop towards the end of February, according to the KFVMDB chart. Officials of KFVMDB have said that the main reason behind the drop in the price of onion is the ease of export from India. Shrestha further added that the price has not fallen due to any improvement in the national output. Nepal has not been able to produce onions though there is high potential for doing so. The main reason is the lack of storage facilities but there are various other reasons as well. Nepal had imported 120 million kilograms of onions worth Rs 3.26 billion in Fiscal Year 2015/16. Onion productivity is declining in Nepal with each passing year. According to the statistics of Vegetable Development Directorate (VDD), onion productivity declined to 12.03 tons per hectare in 2014/15, down from 12.98 per hectare in 2013-14. It further fell to 11.88 ton per hectare in 2015/16. The data also shows that onion cultivation area has remained unchanged since 2013. Onion farming is done in 20,000 hectare of land across the country, according to the directorate. ‘Mission Onion’ program was launched in the Fiscal Year 2007/08 to encourage farmer towards onion farming and eventually increase onion production. But, the program phased out after four years. With lack of programs dedicated to onion, Nepal has relied chiefly on India for onion.